I’ve cooked these gochujang ribs couple times. They’ve always been delicious, but I’m really trying to nail down the technique here. The recipe is from the NY Times. As before, I went light on the rub. I might try tweaking that recipe next time by reducing the salt. I don’t have enough rub on these to create any sort of crust. The ribs were left overnight in the fridge. An hour or so before they went on, I put them in the freezer to cool them more in an effort to encourage a smoke ring. The heat was indirect and I made a custom drip pan out of tin foil to keep the grease from dripping into the fire. For smoke, two large and three little chunks of cherry wood were used. 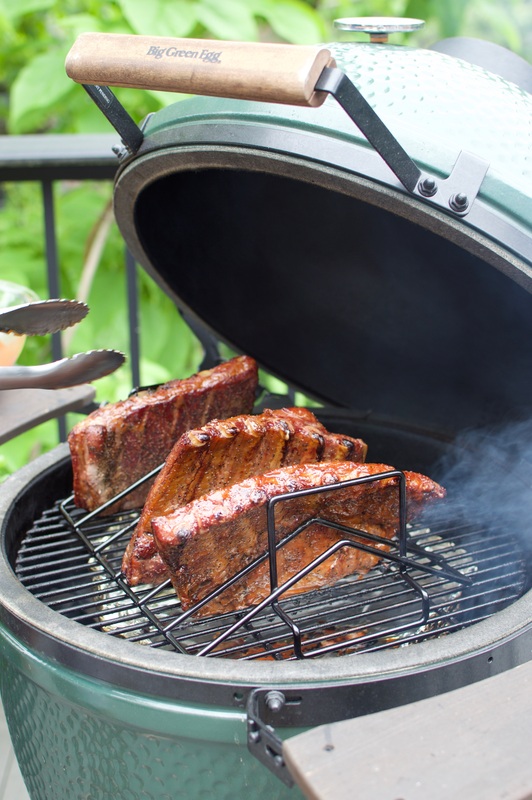 The lid was closed for two hours so that the ribs have some time to get smoke on them. After that, I glazed them every hour. There was no glaze immediately before serving as they had a nice lacquer. I also skipped the peanut and scallion garnish, it looks nice, but I don’t think those extra flavors are needed. The results were very flavorful and tender. 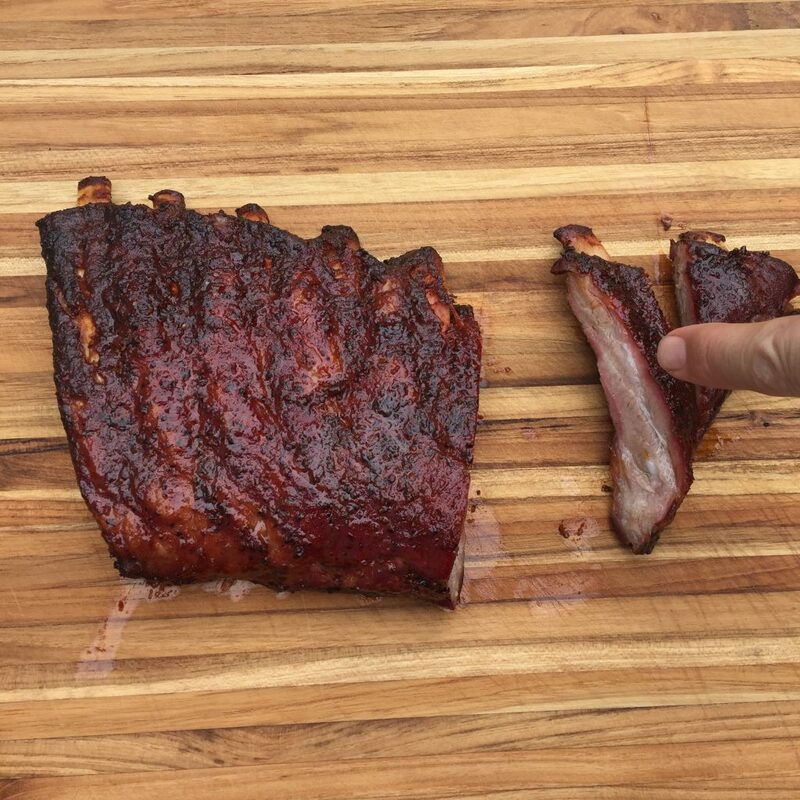 The smoke ring was one of the better ones I’ve produced on the Green Egg. In the future, I think it would be good to let these rest for 10 or 20 minutes before serving. They seem to be more tender and the smoke flavor comes through after they’ve cooled a bit. Below is a log I kept of the cook. It is mostly here to remind me not to mess with the vents too much, just let the cooker cook. 11:40 220 Ribs on. Temperature was rising a bit before opening, bumped both vents down just a bit. Lots of smoke, perhaps too much. 12:18 215 No adjustments. Light blue smoke. 12:30 220 No adjustments. No smoke. 13:12 230 No adjustments. Light blue smoke. 13:20 235 Bumped both vents down just a hair. Will glaze in about 20 minutes. Light blue smoke. 13:50 230 Glazed ribs. By the time I was done, the temperature was at 250 and there was a lot of smoke. No adjustments. 14:05 250 Temperature got up to around 258 or so, but has been coming down. No adjustments. 258 is just about where I would normally get concerned and start messing with the vents. I’m going keep my hands off this time. 14:45 250 Glazed ribs again. No smoke to speak of. Temperature popped up again after having the lid open a bit. No adjustments. 15:40 248 Glazed ribs again. No smoke to speak of. No adjustments. 16:40 255 Glazed ribs again. No smoke to speak of. Tapped vents closed a bit more. 17:15 255 Took ribs off. looks good… I’m going to steal your blast freeze to promote smoke… I’ve always read that cold meat attracts more smoke.. It seems to have helped the smoke ring in this case. 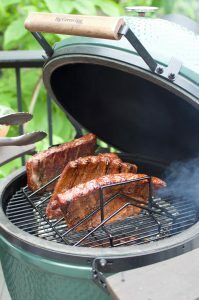 Although, from what understand, the smoke ring doesn’t necessarily mean more smoke flavor, but it looks nice. I’ve also read that charcoal briquettes are the best for creating a smoke ring.